Springtime in the Himalayas, trekking Annapurna, exhilarating views! Join us for a week-long journey in the hikers’ paradise of Nepal when in full bloom. Trek through the beautiful rhododendron forest and breakout to views of rugged snow-capped Himalayas. Walk along the ridgeline and indulge in views of the most region’s most distinctive peaks. Mardi Himal is located to the east of the Annapurna Base camp virtually under the spectacular (and most distinctive) Machhapuchhre (Fishtail). Ascend from forest trail to mountain vistas in 3 days. Witness the sunrise over the Annapurna peaks from High Camp. Leave behind civilisation for 6 days as you take in the soul of the Himalayas. This trek takes you away from the busier Annapurna base camp route while providing the best the region has to offer. Hike up to 3,550m with Macchapuchre, Annapurna South and Himchuli peaks as your constant companions. If you are up for some adrenaline-fuelled activity, there is an option to paraglide in Pokhara with the Nat Geo Adventurer of the Year (2012) at a supplement. EXPERIENCE LEVEL Experience level: Suitable for all levels. After breakfast, you have a scenic domestic flight to Pokhara and then start the trek, an easy walk through the forest to Pothana (1,900masl) (3-4hours). This is the longest day as you ascend approximately 1,000m. The climb continues to climb through the Rhododendron forest. You will reach Low camp in about 3 hours. Pushing upwards, you will come to Badal Danda. On clear days, spectacular views of Machapuchare, Mardi Himal and Annapurna South can be admired from here. The sunset at High Camp and sunrise above the lodge are equally stunning. (3,250masl). Today is a gorgeous day trip to Mardi Himal Camp, returning to High Camp for the night. Farewell to the Annapurna Conservation area! You will hike through the villages to the trail’s end. From here, a jeep will pick you up and drive you to your hotel in Pokhara for a well-deserved shower. Spend the evening in the beautiful mountain town of Pokhara. (2-3 hours). 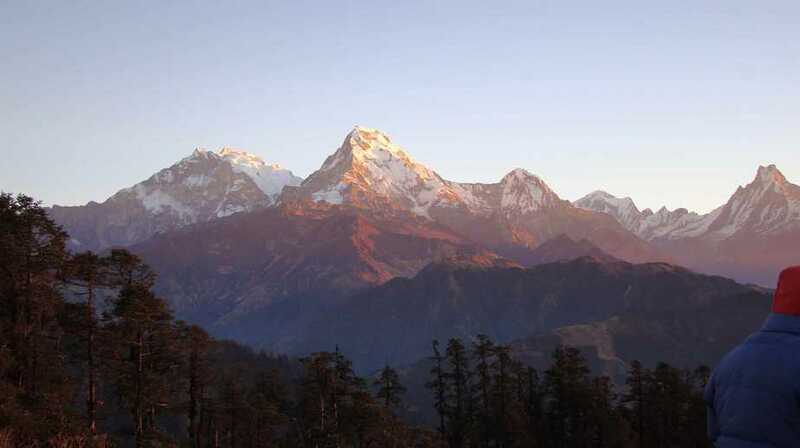 The cost of the Mardi HImal trek is $1800.00 SGD per person.